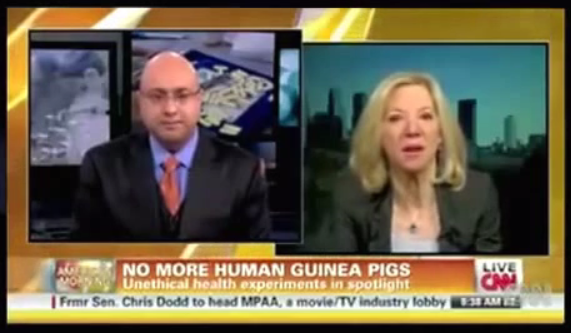 Amy Gutmann is Chairman of President Obama’s Bioethics Advisory Committee. Up to 900 people Testified, up to 300 at each of three committee meetings, public commentary sessions. They attested to being subjected to COINTELPRO like organized stalking and being attacked with electromagnetic weapons. Did she report this testimony to President Obama and he did nothing or is she ignoring it herself and she is not reporting it? I don’t know, but it is being ignored. She and her associates ignored all of the testimony as though it never happened. Don’t they have to act on testimonial reports of inhumane experimentation on human test subjects. This is her job and the function of the Bioethics Advisory Committee. 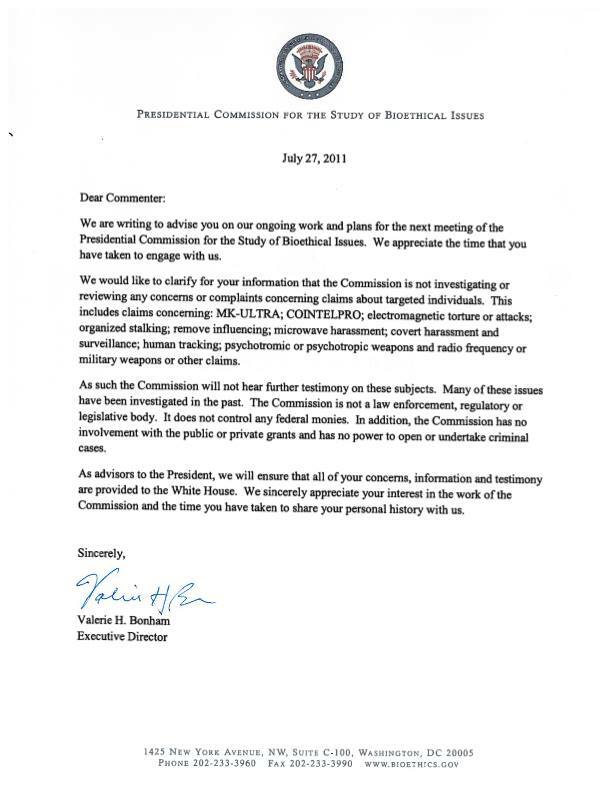 It is unethical for her to ignore legitimate testimony attesting to Bioethics violations. She has to report this testimony and the president must acknowledge it. Notice that there is no media coverage as one would expect; this is by design. This would never happen in a functioning democracy. There are up to 400,000 people affected by this crime of the CIA attacking the citizens. There are at least that many more who are affected and do not know about it. Now, why has President Obama’s Bioethics Committee abdicated it’s responsibility to advocate for medical ethics violations. This is the very reason for it’s charter, yet after hearing from hundreds of Targeted Individuals (TI’s), all with identical symptoms and complaints resulting from torture with electromagnetic weapons, they write the following letter in response to an inquiry about their progress. Committee chairman Amy Guttmann has admitted publicly that it is her committees job to see to it that there are no more unethical experimentation. When questioned about medical ethics violations in the past happening today, Amy Guttmann, said they want to assure the American public “if they are part of a medical experiment, they will be treated with respect and fairly”. It is great to assure confidence but in what? Apparently non consensual medical experimentation is going on now and Amy Guttman is covering it up to make everything look fine in her report. But she forgot to mention all of the testimony about medical ethics violations. If there is a chance this could be true, wouldn’t it have been prudent for her to investigate a little further, or did Amy Guttmann decide not to investigate on purpose. I think it is time we find out where the problem lies. Amy Guttmann said she gave a report to the president about her findings. I want to see that report. I also want to see whatever the President has published on the matter. Somewhere along the way the truth has been lost and I want to find out where to put the blame. This is a disgrace and should not go unpunished. We need to have an investigation of the investigators. The mind has no firewall and the Security Agencies have found a way to get a victims distinctive DNA fingerprint which will allow the victims brain and cellular DNA to respond to their own specific frequencies as if a key unlocked this outcome. This is key because in this way, the frequencies will only affect those who the CIA wants to be affected. All they have to do is to put your DNA fingerprint in the mix and then your brain will respond to these frequencies too. This is not a case of continuing on with your life and ignoring the plea’s of a minority. It affects you too, but they are counting on you doing nothing. You could say I don’t know what I am talking about, but are you going to stake your life on that assessment. I believe the purpose of this program is for social control in neutralizing activists who are now the enemy of the corporatocracy. Martin Luther King was the subject of COINTELPRO harassment back in the 60’s and no one knew about it. It is up to the citizenry to question their government at this point. To further make this point clear, how can it be that the CIA was found to have been testing radiation and mind control on citizens up until 1973 and again in 1995, President Clinton even apologized for the unethical experimentation. Just look at the survivor testimony from President Clinton’s Senate Advisory Committee testimony. They are saying this is happening and continuing, even though it is supposed to have stopped. Yet here again, there is no media coverage and you have probably never heard about it, which is by design again. If no one takes any action and there is no media coverage, then it is as though it never happened. Yet the human experimentation never stopped and is in fact going on at full speed with private government contractors money troughs being full. This is done at the behest of the CIA, with the actual work being done by private corporations. The technology has progressed to the point where this technology can be turned on the entire country. But the people don’t know and are unprepared. Getting back to the CIA involvement, they were guilty of radiation testing and mind control on unwitting human test subjects before, but they were never rebuked or censored. Some reparations were paid to a few key people and the fix was in. The retributions were an insignificant cost of the coverup. It is preposterous to think that the CIA has apologized and that now they would not do it again. It is not an accident that you don’t know about this like I said. They are doing the same things again and in fact have never stopped. The only difference is that technology has advanced the previous program of unethical experimentation. Technology has taken experimentation out of the lab and into the living room. The victims of this experimentation are being experimented on remotely. It has advanced that far. The real question to ask American Citizens is: Will you ignore this plea for help by thousands of innocent citizens. Will you just go on your way and get on with your lives while the government grows its apparent herd of human test subjects to keep subjugated in virtual prison? This herd of citizenry is the subject of brain research, mind control and electronic weapons test on like a herd of cattle. Yes we are human beings whoi have been subdued by this technology and are being herded around by bounty hunter like, private government contractors who keep us in subjugated in virtual prisons. These handlers in conjunction with researchers perform a wide variety of unethical human experimentation on us remotely. This can only spread to more and more people until you or your family is affected. Wont you please watch the video which will prove that this is indeed going on. My name is James F. Lico and I am a Targeted Individual. I have College Degrees which allow me to make observations on the targeting done to American Citizens. Bachelor in Computer Science, Associate in Biology, Associate in Electronics Engineering Technology. I have a good deal of in field experience to go along with the education. MKULTRA was a CIA name for unethical experimentation which effected up to 500,000 American Citizens. There was a Senate investigation which proved this happened and then President Clinton had a Senate Advisory Committee in 1995 and tried to release all of the records from this experimentation. The project went dark and started up again. I am asking you to please watch this video play list and decide for yourselves. All, below please see Eva’s reply. Eva, thank you for taking this very much needed exposure and challenge on for us; the tortured. Too many are afraid to even lightly touch the subject.